Little known fact about me – Crystal Hot Sauce is my family! Crystal is one of the best-selling hot sauces in the United States, and it’s produced by Baumer Foods – a company started by my grandpa and his brother decades and decades ago in New Orleans. This great article in Eater shares more info on Crystal Hot Sauce (thanks to my cousin, Scott, for posting). But Baumer Foods is so much more than hot sauce. It’s all sorts of condiments, including another fave of mine…Crystal Preserves. THE. BEST. STRAWBERRY. JELLY. EVER! 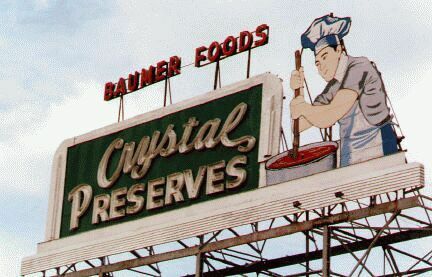 And if you are ever in New Orleans, heading west on I-10 near downtown, you might see a billboard of a huge chef stirring a pot of Crystal Preserves with the words “Baumer Foods” above his head. Yep, that’s us!